Another month has gone by and, as Shakespeare said, April hath put a spirit of youth in everything. And the GoSquared team was no exception. Here’s what we got up to. A major goal of GoSquared is to help you turn drive-by visitors to your website into loyal active users. To gauge how well this is working, and the impact our tools make, we need to measure one simple metric: conversion rate. Conversion rate at this point in your customer’s journey simply measures how many of those visitors sign up for an account. The formula is quite straightforward: conversion = number of signups ÷ total number of visitors. Of course, the figures are calculated for a given period of time, so we can measure how this changes, for example month-on-month. Geoff and Russell came up with an implementation of how we would calculate this from the data you might already have if you’re tracking events with GoSquared. You define your “signup” event, which could be named anything you like – that’s up to you. It just needs to be the event that’s tracked when a user creates an account. Then, we sample a figure for the total number of visitors to your sites, which takes care to exclude any visitors who already have an account. And voila, we have an estimation of the conversion rate. The hack they worked on implemented all of the backend functionality and APIs to retrieve this figure. We can now draw upon this in future and you might very well find the figure somewhere in the GoSquared apps soon. One of the most powerful groups uses of our People Dashboard is the ability to segment groups of your users based on similar behaviours they share. These behaviour’s could be properties of the user, such as their lifetime value to your site. You can also segment based on specific events that your users have performed, like logging into their account. By using filters to build these behavioural segments, you can start to gain important insights about groups of users. While you are able to do this easily though our UI in our People dashboard, we have had quite a few request to be able to use these filters directly through our server side libraries. Russell took the opportunity this Hack day to add this functionality to our Ruby Library. It’s like GoSquared Chat, but in other languages! Oh là là! Ever since Live Chat launched, we’ve had a fair number of requests for the customer-facing chat client to be available in other languages — a challenge which Leo took up this hack day. The work to do this can be divided into internationalisation (i18n), which involves making the code and design conducive to being translated, and localisation (l10n), which is the actual process of making the product suited to a particular locality or language community. On the i18n side, all the English strings needed to be replaced with templated lookups, with placeholders for any dynamic text (so as not to make any assumptions about the order of words in a given language). The CSS also needed some changes to accommodate strings of varying lengths — where previously it was assumed, for instance, that a button would always be the same size. 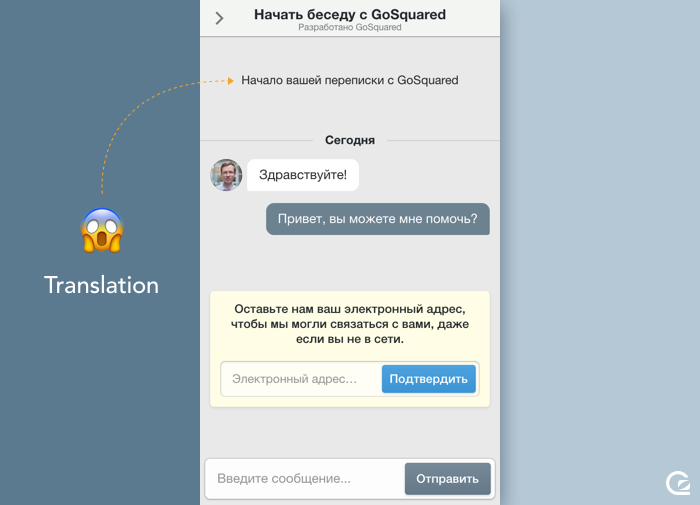 As for l10n, Dina provided our first translation, into Russian! If you want to get involved – submit a translation here! On hack days, James usually takes the opportunity to jump back into a little design work. This month was no exception, and saw a new homepage design role out. The new homepage is currently being A/B tested against the original homepage, to understand which performs better at driving visitors to sign up and start a trial. The new design focuses more on our “turn visitors into customers” tagline, with a playful and vibrant abstract funnel visualisation as the background to the page. The page also highlights our high customer satisfaction ratings on a few of the key software review sites. 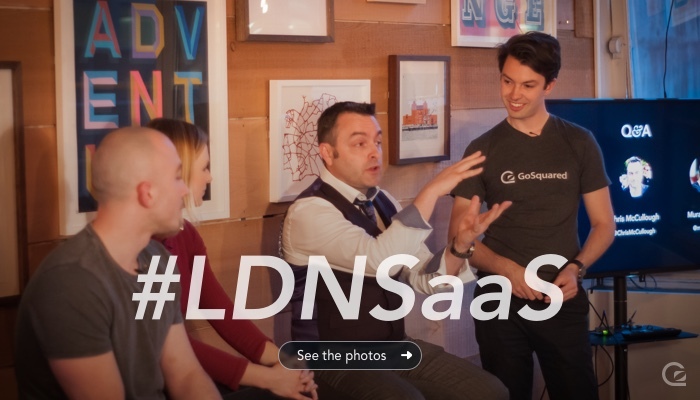 April’s hack day took place the day after our second LDNSaaS event, Brennan and JT spent the day collating, editing, and publishing the photos and audio/video recordings from the event. If you haven’t already seen them, you can check out the photos on Facebook, and watch the videos and read more about the event in out roundup blog post.